The Old Codgers — the Staples Class of 2001-based team — won its 3rd Preston Hirten Tournament title in 4 years this morning. 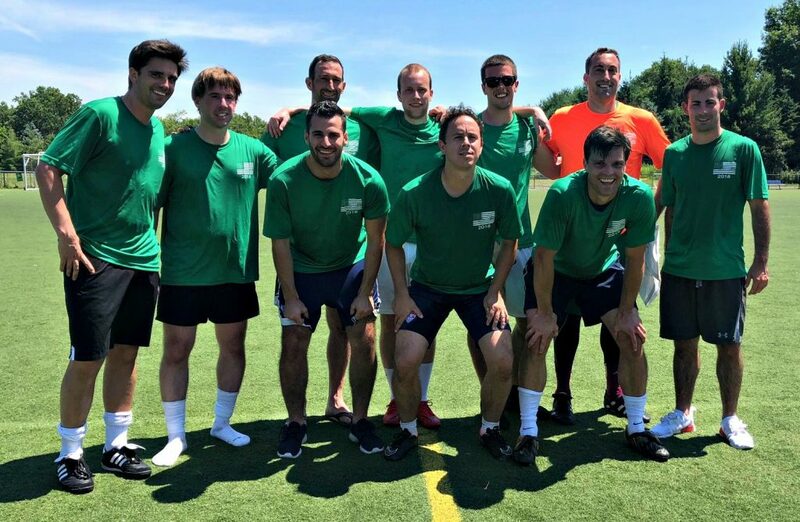 They outlasted Axe Capital — the Mary Washington University alumni — 2-1 at Wakeman Field, on the hottest day this year. Axe included Matt Lamb ’07, a teammate of Preston’s at both Staples and MWU. Former Staples players on the winning side included Jason Alvarez ’02, Mike Carey ’01, Brendan Cass ’97, Brandon Lamb ’01, Jordan Schur ’01 and Jim Wolf ’01. The victors were cheered on by several of their wives and young children. The event — now in its 9th year — honors Preston Hirten, the All-State player on the Wreckers’ 2006 state finalist squad. He died 3 years later during pre-season at Mary Washington, from a previously undiagnosed heart ailment. This year’s tourney drew 10 teams, including 2 made up of current Staples players; various alumni sides, the Staples girls team, and a Beachside alumni squad. 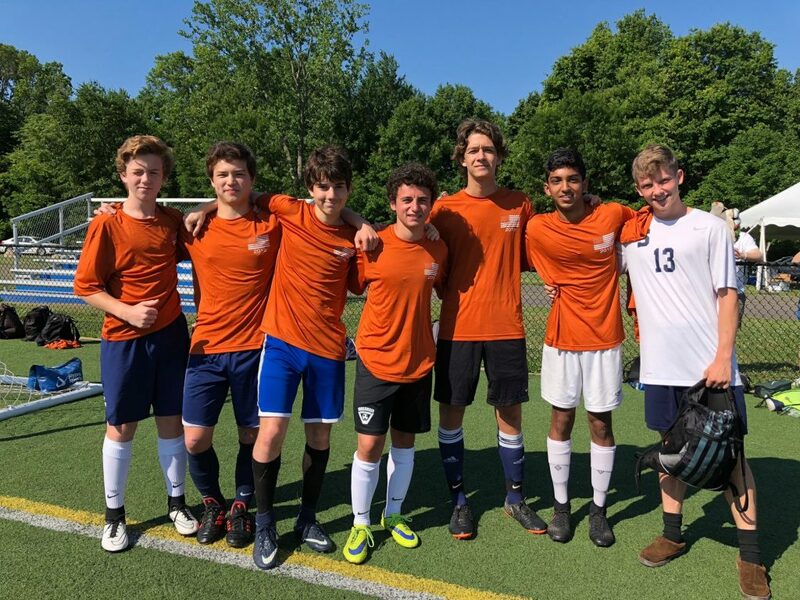 The Banter Bus team — comprised of returning varsity players and varsity hopefuls — fell 1-0 in the semifinal to Axe Capital. Players included Nick Ambrose, Surya Balaji, Josh DeDomenico, Sam Liles, Brendan Lynch and Vaughan Sealey. The Old Codgers captured their 3rd Preston Hirten Tournament championship in 4 years. 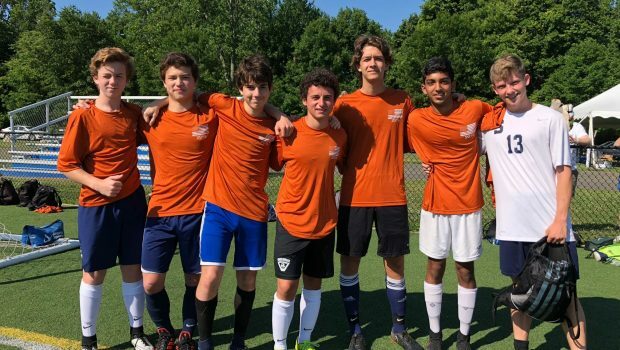 The Banter Bus team included (from left) Sam Liles’ friend from Massachusetts, Nick Ambrose, Joseh DeDeomenico, Sam Liles, Brendan Lynch, Surya Balaji and Vaughan Sealey.